People underestimate the aesthetic beauty of concrete. It is celebrated the world around for it’s durability, toughness and value-for-money but it doesn’t get the credit it deserves for the sheer variety of looks you can create out of it. It malleability means you can add your own touch to the concrete – give it a special finish that raises it above a slab of water, aggregate and cement. There is no other material packs the functional and aesthetic punch that concrete does, so we thought it was time to give concrete its due by creating this guide to concrete finishes. This is the basic concrete finish, but it is surprisingly difficult to achieve. You have to be a master on the screed and trowel to get a completely smooth finish to your concrete. The screed levels out the surface and it is usually made out of a long piece of metal or wood that is dragged and pulled along the surface of the concrete. The trowel is then used to smooth out the surface even more and get rid of the smaller lumps and bumps that the screed couldn’t. Edging is used to both strengthen and beautify the concrete. The edging tool is used to create joins in the concrete making it stronger and less prone to cracking as well as to give the concrete neat, bevelled edges. The broom finish is a quick and easy way to give concrete a non-slip finish. You’ll notice this finish in public spaces and it simply involves running a broom over the top of wet concrete to create little ripples and lines. This is a very popular finish. Not only is it a way to add a non-slip texture to your concrete it will also give it a beautiful, textured visual element. Exposed aggregate works in driveways, around pools, footpaths and for patios. This look is achieved by washing the top layer of concrete away so that the aggregate in the concrete mix is exposed. To add another dimension to this look stones like quartz, granite, basalt and even seashells can be added to the mix. You’ll most commonly see this finish on the base of, and around swimming pools. This look is very easy to create. All you have to do is sprinkle rock salt on the surface of the concrete and wash it away. The salt will leave little holes in the surface, similar to how the sea leaves little holes in rocks along the coast. This look is gaining popularity due to its ability to mimic natural building materials, such as bluestone, tile, brick and slate. A stamping panel is fitted with a design and the concrete is then stamped with the design while it is still wet. The beauty of this method is that you can enjoy the look and texture of the above materials, without having to pay the exorbitant costs and deal with the maintenance demands they carry. This is very similar to stamping, except instead of using a stamp a stencil is rolled out across the surface of the wet concrete and then applied to the surface using a roller. A stencilled finish also gives you the ability to create a multitude of looks, including brick bordering, without having to pay for the materials. You also get to enjoy the durability of concrete – instead of having to replace tiles, loose bricks and cracked slate every couple of years. Pigments: This is the process of adding pigmentation to your concrete mix before it is poured. Pigmentation is typically limited to earthy colours (red, brown, green and gray) and you have to ensure the concrete is well sealed in order to maintain the vibrancy of the pigmentation. Painted Concrete: This is done in the same way that you would paint a wall. Once the concrete has cured the paint it will last for as long as you keep it sealed. There are a huge variety of colours to choose from and you can team it with stamping or stencilling for an utterly unique look. This is a great option for people who are undecided about their indoor flooring option. Polished concrete looks incredible, it is great value and it is incredibly easy-to-maintain. On top of all of that, it is naturally non-slip. Concrete is polished using a concrete floor grinder, which is fitted with diamond abrasives. The coarseness of the diamond determines how polished the floor is, meaning you have complete control over the look. Chemical hardeners are often added during the polishing process to protect your new floor from water and coatings can assist in preventing staining. It’s a great option for a home, where things falling on the floor are a daily occurrence. So, there’s your complete guide to concrete finishes. There are new finished popping up all the time as people find new ways to use this incredible construction material. 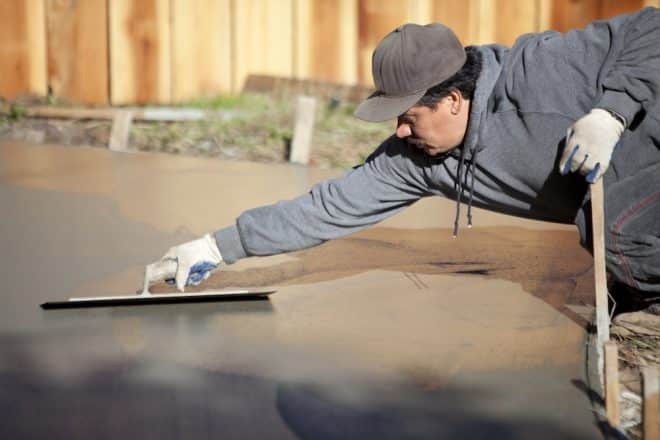 If you’re considering a concrete finish for you home or backyard, contact Everlast Services for a free quote.